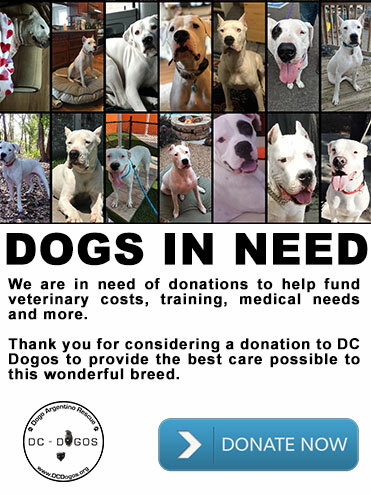 DC Dogos Inc is a non-profit organization dedicated to Dogo Argentino rescue efforts. Our goal is to help this wonderful breed and educate owners and adopters so that every Dogo has a place to call home. To preserve the Dogo Argentino breed by rescuing Dogos in need, rehabilitating them through nutrition, training, and veterinary/behavior care, and ultimately placing them in loving adoptive homes. DC Dogos, Inc. is a 501c3 non-profit animal welfare organization which provides for the rescue and rehabilitation of dogs conforming to the Dogo Argentino breed. We work on a national level to advocate for Dogos. We provide breed-specific expertise to owners and other rescue organizations on the Dogo Argentino. If we can help with education or information about the breed, please contact us. We love saving Dogos, but we can’t do it alone. DC Dogos, Inc. is a Maryland non-profit corporation qualified under Section 501(c)(3) of the IRS Regulations. Give us a leg up so we can get them back on their paws.